Georgia Sports Blog: Did Georgia's defense need new blood? 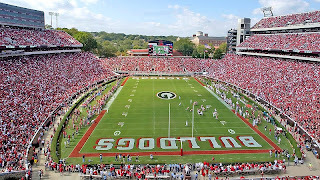 Did Georgia's defense need new blood? Do you realize we have all of those kids who are still wet behind the years that will be starting on defense? My GOD, there'll be ALL THOSE TIGER PEOPLE in Orange yelling at them stacked on top of each other and all we'll have is 500 people and the band down in that one little corner. I just don't see how we can possibly keep Clemson from scoring 100! We are just gonna have to play that base defense and HOPE we can keep them out of the endzone enough to let Murray and Gurley and Marshall and Mitchell and all those guys do something. Hey, I get it. We ARE young in the defense. We might well be just that green. I'm not saying we won't be, if for no other reason than we are that green. I'm still working on a post about scholarship numbers, but just glancing at the projected depth chart, we'll have exactly three seniors on the three deep (four if you count Blake Sailors who is the fourth CB listed). We only have 10 juniors and one of those just transferred in. That isn't irrational, that is facts. However, one thing we've heard about all off season is how poorly Grantham's defense did last year. I didn't buy into them being terrible, but they weren't elite, either. Granted we held teams to below 20ppg, but still we were middle of the road in many other measures and worse in total rushing defense. That was with Jarvis Jones anchoring the defense. “I was surprised (more didn't),” Glenn told me. “Georgia easily could have won it all last year and they return most of their offense and (Aaron) Murray from that team. And I think it’s good that they don’t return that defense. Sometimes it’s better when you don’t return players from a bad unit, you know? So I think that’s a good thing, too." Guilbeau is saying UGA will be better because they aren't returning players from a bad unit. Now, I wouldn't have put it quite that way, but that is one thing that I've been rolling around my head for a few months. There is a whole other post on why we didn't do more substituting on defense, especially on the line, but we'll definitely have fresher bodies, because we have more of them. I don't buy the new guys can only improve the defense argument. Unless that was a shot at Garner, which I don't think it was. However, I don't think we have necessarily be better. We just can't be worse, which I don't think we will be. Actually, we have to be more consistent at stopping the run and we have to be better at getting off the field on 3rd and short. Teams converted just 37% of 3rd down conversions on us last year. Nearly a third of those happened on 3rd and short rushing plays, with teams converting 60% of those rushing plays. Teams were 6 of 10 in converting passing plays for first down on 3rd and short. One last thing: we've got to get Matthews and some of these other guys healthy and let them practice at full speed. Because nothing is going to prepare him for the speed of Boyd or Watkins, especially if he's in green until the end of next week. And that is definitely a source of concern for Westerdawg and myself. This will be my first year with season tickets which means Im going to start hosting a tailgate every week. I've gotten most of the supplies I need and just realized that Im not sure where to park. I am open to buying a parking pass or finding a pay lot somewhere semi-close to the stadium. Does anyone have any suggestions for me? Finally, there are plenty of places you can pay to park, but not on campus. I'd suggest some of the businesses on Baxter. Thanks.. I'll look into it. I have one more question.. I'm also in the market for a generator and think i've found a good one on craigslist. The seller tells me its about as loud as a small lawn mower.. is that going to be an issue on gamedays? For the record, I'm not in panic mode. I'm saying that stuff above is what Munson would be saying. I think we'll have to score 30+ win b/c the defense isn't going to stop Clemson. There's no reason to think a DL who couldn't beat out last year's underachieving, injured group will be that much better. And we have babies (who haven't practiced) in the defensive backfield. I can agree with this. I think the "addition by subtraction" idea is misplaced and a little optimistic. I think added depth on the d-line will help from a freshness standpoint, but you cannot discount the value of experience, even if the experienced players didn't meet expectations. Depends on where you tailgate. I know. But you do a pretty mean Munson. There are many good options outside of parking on campus. You can park in the downtown decks for ~$20 and leave your car overnight, tailgate on North Campus. You can park in the Bloomfield / Cloverhurst neighborhood, for free if you get there early enough, and tailgate along Lumpkin or at Myers. Alot of people tailgate on east campus as well, but imo you can't beat Myers, North Campus, and the Lumpkin areas.